Methadone is a long acting pain reliever producing effects that last from twelve to forth-eight hours. Ideally, Methadone frees the client from the pressures of obtaining illegal heroin, from the dangers of injection and from the emotional roller coaster that most opiates produce. Methadone, if taken for long periods and at large doses, can lead to a very long withdrawal period. The withdrawals from Methadone are more prolonged and troublesome than those provoked by heroin cessation, yet the substitution and phased removal of methadone is an acceptable method of detoxification for patients and therapists. 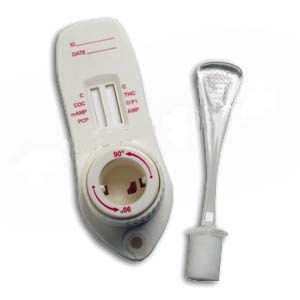 The One Step Multi-Drug Screen Test Panel provides only a qualitative, preliminary analytical result. A secondary analytical method must be used to obtain a confirmed result. Gas chromatography and mass spectrometry (GC/MS) is the preferred confirmatory method.